There’s sure to be no love lost when Skegness Town and Skegness United meet in the derby on Valentine’s Day. Neither side has had the ideal preparation going into the match at Wainfleet Road, where Town make the short journey from Burgh Road on Saturday. 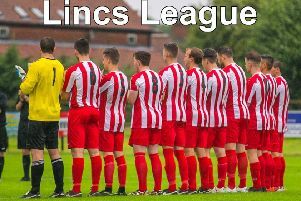 The two Skegness sides have been dogged by postponements during the last two weeks, which has seen them slip down the league table. The Lilywhites now lie in third place after a fortnight’s inactivity, while United sit in sixth, still looking for their first point of 2015. Town boss Nick Chapman is hopeful that he will have a full squad to choose from, apart from Will Britton, who is believed to be a couple of weeks away from full fitness. “It’s not been ideal prep, especially as we haven’t been able to train because of the weather,” said Chapman. “But the boys are buzzing and can’t wait to put the disappointment of losing to Wyberton behind us. After a number of weeks without a game and previous selection issues due to absences, United manager Mark Hallam said: “Hopefully, if I can get a good strength team or somewhere near that we know that we can give a good account of ourselves and on our day can beat anyone. Hallam also insists that form and previous results count for nothing on derby day, and is confident of a good result. Chapman was conscious that the likes of Horncastle and Hykeham were staking a valid claim for the championship crown. But he wanted to reassure the Lilywhites faithful that they would not be giving up the title without a fight. “We are in good shape and we won’t be handing it over lightly,” he promised. The game is due to kick-off at 2pm.